Mandala stencils are very popular in today's decorating. With our amazingly detailed Brilliance mandala stencil, you can quickly add beauty and pattern to any plain wall or floor. Our large mandala stencils can be stenciled in one or multiple colors to match your decor. Mandala stencils are quite easy and fast to use despite there intricacy. Mandalas are a perfect choice for a first time stenciler. Our mandalas are original hand drawn designs created by stencil designer Janna Makaeva, and exclusive to Cutting Edge Stencils. For the mandalas that are 18" to 30", you will be receiving a full circle stencil. For the 36" and 44" mandalas, you will receive half of the design. To complete the circle, tape and stencil the 1st half of the mandala, then pick up the stencil, rotate it 180 degrees and line up the registration marks (see photo above), tape it and stencil it again. Mandala stencils are so easy to use, virtually anyone can do it. Simply tape it to the wall or floor using BLUE painter's tape, then load your foam roller with the paint of your choice (latex or acrylic). Don't use too much paint! Get rid of excess paint by rolling the foam roller over a folded paper towel. Then, just roll it over the stencil applying light to medium pressure for an quick fabulous result! Don't press on the roller too hard otherwise you might get some paint seepage under the stencil. Mandala stencil designs are easy to stencil with a dense foam roller. However, for multiple colors, please use various stencil brushes. For expert stenciling tips, please watch our How-to stencil videos! You'll find them extremely helpful for your stenciling project. Even beginners get great results! Although most of our stencils do not require the use of spray adhesive, if your walls have a texture to them, it might be a good idea to use spray adhesive to help minimize paint seepage (Elmer's spray adhesive seems to be the best). Make sure you shake the can well and lightly mist (not drench) the stencil, and let it dry for a moment before positioning it on the wall. This step will prevent the adhesive residue transferring to the wall. You'll need to re-mist the stencil after a few repeats. Note: you will still need to hold the stencil in place with a few pieces of blue painters tape! Adhesive by itself is not enough to hold the stencil on the wall. Stencil Cleaning tip: Spray the stencil with Simple Green to help to remove adhesive residue and let it sit for a while before cleaning with soap and water. Please note that it is virtually impossible to get rid of all adhesive residue. That's why we personally prefer not to use it and just stick with painter's tape! 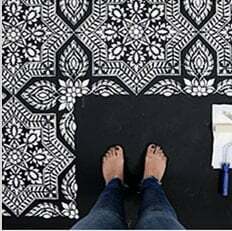 Did you know you can stencil your own fabric and use it for curtains, hanging tapestries, tablecloths, pillows, etc.? When stenciling on fabric, please use stencil adhesive to ensure good results. First, tape your ironed fabric to the surface so it doesn't move around while you stencil. You'll get better results with stencil brushes, but sometimes roller can work too, depending on your fabric. Add some textile medium ( sold in craft stores) to your regular acrylic paint. You can also get specially formulated fabric stencil paint for your textile stenciling project. Let the stenciled image dry completely, 24 hours is best, then heat-set it by ironing the fabric for about 20-30 seconds on a LOW setting through the piece of cloth. Heat-setting will cure the paint and will prevent it from being washed off in the washing machine. Always experiment with a sample of your fabric first to ensure good results. We have stenciled on silk, cotton, linen and even sheer fabrics with great results. It's always better if your fabric doesn't have too much texture. Our stencils are made to highest industry standards and with proper care and storage will serve you for long time.